Think Pacific was launched by Simon and Harry. Two students who taught in rural primary schools in Fiji in the early 2000’s. We fell in love with the culture, customs and people of Fiji. Inspired by the needs and wishes of Fijian communities, we accepted a monumental challenge from a Chief, which would change the course of our lives. 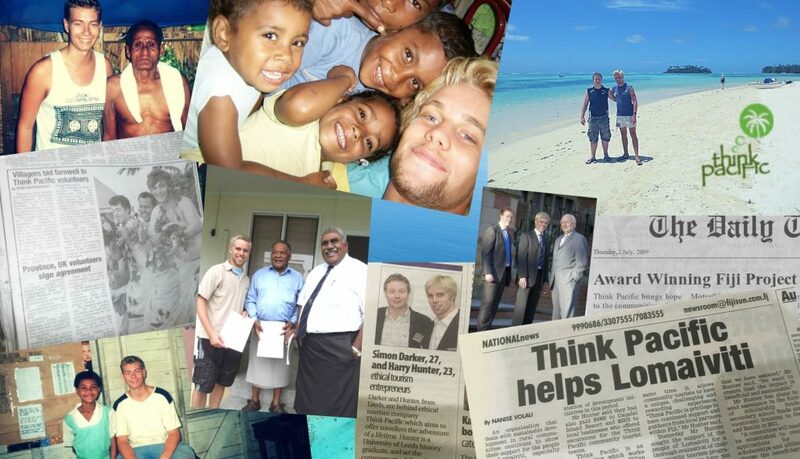 Simon and Harry volunteer on their respective gap years in Fiji, we both fall in love with Fijian life and return year after year to support our schools and keep in touch with the communities. Invited to a kava Ceremony in a remote Fijian village on Simon’s fifth trip back to Fiji, he meets chiefs, teachers and local government officials and listens to local ambitions to uplift children out of hardship. We work on a proposal and a year later, we present the concept to residents in Fiji, who are enthused by the idea. Paramount chief, Ratu Joe, asks us to promise we’ll return and make the project a reality. We work from a spare bedroom in Simon’s terraced house in Leeds and spend the next 3 years tirelessly researching and planning. Through part time jobs we pay the bills and fund several return trips to Fiji. Supported by Fijian chiefs and local communities, we meet and present to the Fijian Ministry. We ensure the aims align with national objectives and meet the most ethical processes. We are granted official approval to launch. We enter a graduate process at The University of Leeds, searching for the ‘Best Business Enterprise Concepts’ and after a ‘Dragon’s Den style’ process we are accepted and gain huge support and expertise from University Staff. We win The Leeds University Best Enterprise Award, The Yorkshire University Best Enterprise Award, The Sir Peter Thompson Award and reach the finals of the Shell Livewire Award, helping us to test our concept and provide the vital funding to launch. 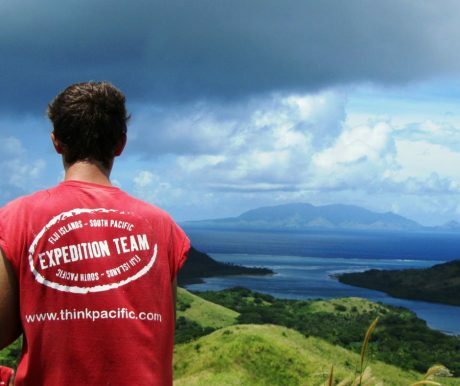 On the 2 July 2009, 16 gap year and university students join our inaugural project and the dream of Think Pacific begins. Over the next few years we guide over 2000 young people to Fiji, support hundreds of schools and communities and invest over 3 million dollars into Fiji. We arrived to the sound of drums banging, villagers singing and Fijian ladies throwing garlands over our necks. The kids scrambled to carry anything they could of our belongings to help us into their homes. The smiles of the volunteers expressed pretty well how everyone was feeling. Would You Like to Join Our Journey? 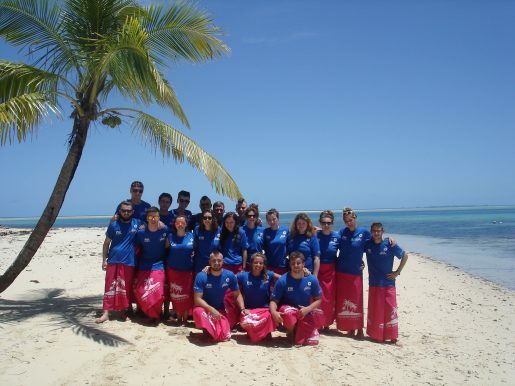 July 2009 – 5 years after the Idea of Think Pacific was conceived, our first team of eager volunteers arrived in Fiji. The Provincial Council asked us to start programmes on an Island called Moturiki, one of the poorest in Fiji and achieve a set plan of objectives over the next few years. We greeted our first group of volunteers with the nervous excitement you can only get from venturing into the unknown. 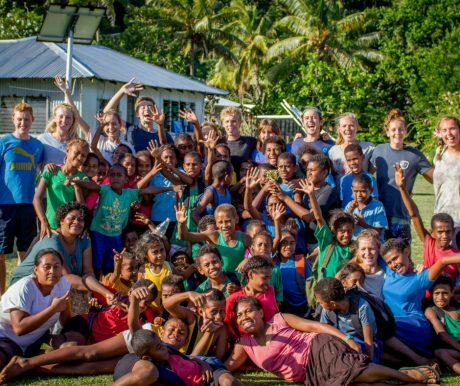 During our first ‘TP Expedition’ we renovated the islands’ health clinic, built a community kitchen and led a programme of grass roots education and sports. Harry guided the project with a good friend from our teaching days in Fiji, Benji. We made national news and government ministers and high chiefs visited for the grand opening. 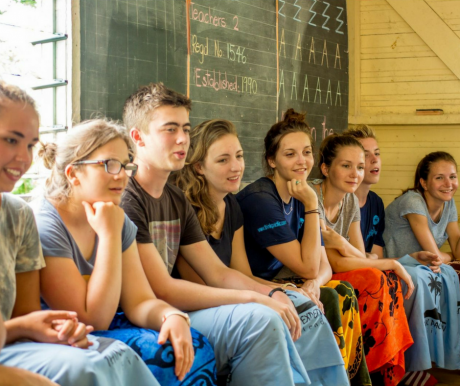 Fijian life had a huge impact upon volunteers, with students describing their experiences as ‘life changing’. Members of that first team would return to volunteer and work for us in later years. Harry moved to Fiji permanently and Simon continued to run Think Pacific UK from a spare bedroom in Leeds. We spent a year on Moturiki Island. We created a community centre, built toilet and sanitation blocks and installed fresh water to remote Savuna village, a feat which had the entire community in tears of joy as piped water flowed for the first time into the village. We organised inter-school sports tournaments for the islands’ children and saw children from Moturiki get picked to play for the Fiji national youth rugby team. In the UK we were honoured to receive the Sir Peter Thompson Award for efforts to alleviate poverty, be named as two of ‘Britain’s top young social entrepreneurs’ in local and national awards and reach the final of the Shell Livewire young business of the year competition. By the end of 2010, we had guided our 7th expedition and invested over FJ 300,000 into Fiji. With project achievements going from strength to strength on Moturiki Island and interest from UK gap year volunteers increasing, we launch our second project location as we visit the more remote island of Batiki and guide programmes in two separate areas of Fiji simultaneously. On Batiki Island we complete a massive ambition…building our first kindergarten school. By the end of 2011 we have launched projects on a further island, Nairai. We have now established early years education provision for 14 villages, introduced structured sports for 4 primary schools and improved basic sanitation, water and community facilities, for over 1,000 people in Fiji’s rural areas. We achieve the construction of a nursing clinic to improve basic access to health care for island communities. A huge moment in 2012 as we launch projects on Gau Island, one of the biggest islands in the province and our most remote location to date. We guide a record number of volunteers to Fiji. We build a second kindergarten school and a school boarding accommodation. We pioneer a programme of extra-curricular activities across all island primary schools, implementing government backed PE lessons and our ‘House Cup’ Programme to open children up to arts, drama, music and public speaking. We facilitate an island rugby and netball challenge tournament. 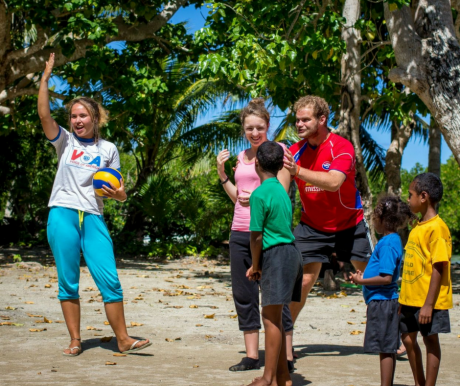 In the UK we move from the spare bedroom into a proper UK office and our first members of staff, Ronnie and Lee are recruited help to prepare and inspire a new generation of volunteers to Fiji. 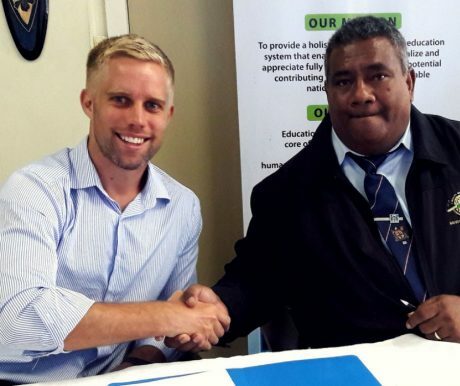 One of Think Pacific’s biggest moments was signing an official MOU agreement with the Fijian Ministry of Education, The Fijian Ministry of Health and The Fijian Ministry of Youth and Sports. 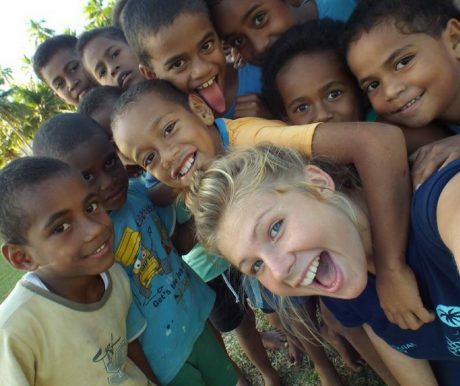 2013 was also the year when we delivered our first university partnership project as 40 students from Leeds Beckett University embarked on a summer placement to Fiji. We organised a national youth and sports conference and introduced rugby league to remote areas of Fiji. 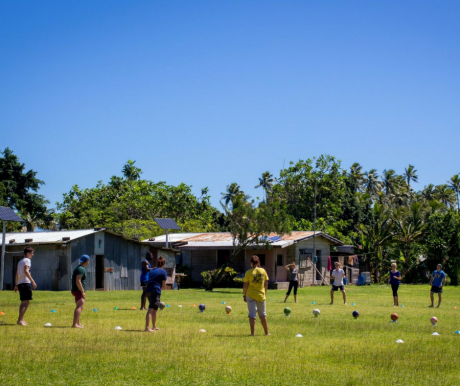 It was a great day when we launched our projects on Koro Island and employed our first youth and sports officers, who visit remote areas to deliver workshops and provide sustainability to the schools year round. Add to this, we begin a partnership with the Fiji Sports Commission to develop the ‘Educate the Educators’ programme and start training teachers. This is our first year focusing purely upon Youth and Sports programmes. In collaboration with the government and local communities we set ourselves an ambitious target of supporting over 10,000 children. We focus upon the poor and rural schools of Ra Province, with schools highlighted by the Fijian Ministry. Alongside gap year projects, we lead student teams from Cardiff, Exeter, Oxford Brookes and Leeds Beckett Universities. We finish the summer with huge inter-school sports competitions, which create a real buzz across the province. We reach our target of opening sports and extra-curricular activities to 10,000 children and we further develop our ‘Educate the Educators’ projects to train local teachers. Our programmes make national news and the British High Commission visits our projects and describes our impact as an “outstanding contribution to Fiji”. 2015 marks an emotional moment in TP history as our final project takes place on Moturiki island. We achieved everything we promised to the chiefs and rural communities. In five years we visited every village on the island. In total, we invested over 1 million Fijian dollars, improved water and sanitation, created community centres, school classrooms and health clinics and developed a sports and extracurricular programme that is now running long term. We trained unemployed Fijian youths, created jobs and left a sustainable model of sports and youth activities. 2015 also marks big things for our National programmes, as our youth and sports initiatives develop further. We guide over 250 volunteers, we support over 50 rural schools, we support national health awareness initiatives and we confirm an official UNICEF Partnership to collaborate on mutual sports development aims. Think Pacific Charity is officially registered in the UK. University projects increase as students from across the UK pioneer our growth. We witness high levels of achievement in the schools we support, increasing literacy by over 40%, increasing sports participation by over 600% and funding early years education for 1,000 children. We create a partnership with Little Ones kindergarten and map out a long term plan to support 10,000 children to receive early years provision. 2016 was also a challenging year for Fiji and Think Pacific, but one of our proudest. Cyclone Winston struck Koro and destroyed many homes and the livelihoods of families who have welcomed our previous volunteers. We were the first organisation in the world to bring aid relief such as food, water and shelter to the island. We couldn’t have done so without the wonderful help of our community of previous volunteers.